3. Click Download, The Setup will open then you'll click save. Go to the download folder of your system to locate the file (Nairaschools JAMB CBT Training), Double-Click it to start installing it on your computer, Its very easy to install. You can also CLICK HERE to open & download the Setup. Send it to nairaschools@gmail.com you will receive a payment instruction within 10mins, follow the payment instruction to get your Activation code within 24 Hours. Its just N2,000 Only to validate a computer system & its valid for one year. No internet access is needed to use the App on your system after validation, its doesn't need internet to work. You can also save the setup on your flash drive then take it home to install on your computer, one setup can be used to install the CBT Software on different computer systems, it will generate separate Product ID for each of the systems. If you're activating more than one system, kindly separate their Product ID with Comma. Training could be a nonstop technique for getting information. 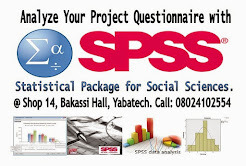 it's no any age limits and http://www.spsshelp.org/online-spss-education-services-to-analyze-spss-data/ website provides nicely info. we have seen huge numbers of us getting training even in A development that demonstrates their energy towards think about. To comment with your Yahoo ID, Click on OpenID then type www.yahoo.com it will enable you to comment with your Yahoo Account. Click Notify me to stay updated with comments.